Quantity surveyor (QS) is one of the professional advisors to the construction industry. Quantity surveyors are employed on major building and construction projects working closely with architects. They may also work as academics in the building and construction disciplines and in financial institutions, with developers and as project managers. With rapidly developing economy this career has become one of the important, highly respected and well paid professions. The job market for this profession is growing day by day. In Sri Lanka there are lot of ongoing construction and lot of constructions to come. This has been a great opportunity to young people to think and start their carrier as a quantity surveyor. In Sri Lankan construction field they expect quantity surveyors to be well educated and experienced. In Sri Lanka there are good and well recognized courses to become a qualified quantity surveyor. Below I have mentioned about the recognized courses and institutions to start your studies to become a respected quantity surveyor. Department of Building Economics offers a four-year Bachelor of Science honours degree in Quantity Surveying with wide range of subjects related to the construction cost management and total management of all services that support the core activities of any construction product. If you have a good Z-score at GCE A/L then you can enter this course. To enter this course you need Combined Mathematics or Higher Mathematics and any two of the following subjects at their General Certificate of Examinations (Advanced Level). The College of Quantity Surveying is the Educational Institute established under the Institute of Quantity Surveyors, Sri Lanka (IQSSL). They offer Higher National Diploma in Quantity Surveying. The OPA Professional centre, No.275/75, 2 nd floor, Prof. Stanley Wijesundra Mw, Colombo 07. ACTA was established consequent to a budget proposal in the year 2005 by the Government of Sri Lanka, with public & private sector partnership to serve the construction industry sector. It is registered with the Tertiary & Vocational Education Commission as a training provider which they give NVQ qualifications and it is also affiliated to the Northumbria University UK, and is a EDEXCEL BTech Registered Center. Quantity Surveying (Part Time ACTA Level 5) – Six months full-time course in English medium, which costs Rs 90,000, You get National Diploma at the end of the course. Quantity Surveying (Part Time-ACTA Level 6) – 18 Months part-time course conducted on Sundays in English medium, which costs Rs 90,000. You get Higher National Diploma at the end of this course. 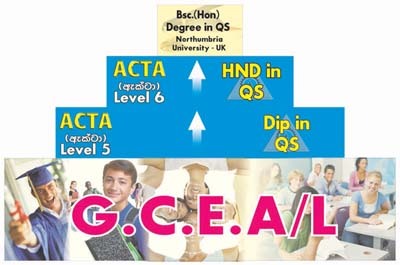 After ACTA level 6 you can follow degree program from Northumbria University UK. University of Vocational Technology (UNIVOTEC) has produced a several batches of National Diploma Holder (NDQS) Quantity Surveyors. Diploma holders of this NDQS are already employed in the Middle East and Sri Lanka. Their modified course syllabus which is designed by top level national and international industry professionals with the participation of IQSSL, has now been accepted for NVQ#5 and 6. This government university delivers a one of the best quality oriented programme as they are not financially motivated to produce QSs in mass-scale. This institution is well known for quantity surveying. This is situated in Pita Kotte. This institution is focusing their studies on the construction. For They conduct a HND course in quantity surveying which is recognized and approved by IQSSL. This is a three year course with theory and practical components, which costs around Rs.234,000. CSCT maintains the quality of the program with the partnership of EDEXCEL. After completing this three year course you can become a recognized quantity surveyor by IQSSL. After completing the Diploma course you can continue to do the degree at CSCT. They offer four year BSc (Hons) degree program in Quantity Surveying, offered in affiliation with University of Salford Manchester UK, which costs around Rs 800,000. Contact: Colombo School of Construction Technology, 48, Talawathugoda Road, Pita Kotte. ICBT has wide chain in Sri Lanka and has a great history of 12 years. ICBT also conducts the same HND course in quantity surveying. Course duration is 2 years with 6 months training period, which costs Rs.260,000. They also offer two degree programs in this field. BSc (Hons) Quantity Surveying & Construction Management accredited by Sheffield Hallam University in UK, which is a 2 1/2 year program. If you start from the begining for Higher National Diploma and degree program both cost more than Rs 1 million. This is another popular institution for higher studies situated in Colombo 6. This institution is conducting the same UK approved BTEC HND in Quantity Surveying. This course is based on 18 moths program with three month industrial training. They have the facilities for students to continue with the degree in Sri Lanka or transfer option to the University of Wolverhampton. For the 18 months HND they charge Rs.268,000 and to continue with the degree students have to pay extra Rs 500,000. Technical colleges also offer free Diploma and degree level NVQ qualifications in Quantity surveying and other courses relating to Building and Construction industry. icbt eke qs hnd eka hdaida?valid da?